It comes amid heightened tensions between Gulf countries and their near-neighbour, Iran. The Saudi statement accused Qatar of collaborating with "Iranian-backed terrorist groups" in its restive eastern region of Qatif and in Bahrain. The diplomatic withdrawal was first put into motion by Bahrain, then Saudi Arabia, the United Arab Emirates (UAE), Egypt, Yemen, Libya's eastern-based government and the Maldives all followed suit. Saudi Arabia, the UAE and Bahrain have given all Qatari visitors and residents two weeks to leave their territory. The three countries have also banned their citizens from travelling to Qatar. However, Saudi Arabia says it will still allow Qataris to take part in the annual Hajj pilgrimage to Mecca. So far, there has been no sign of reciprocal moves by Qatar. Wealthy individuals in the country are believed to have made donations and the government has given money and weapons to hardline Islamist groups in Syria. 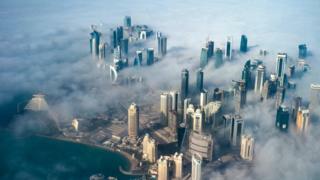 Qatar is also accused of having links to a group formerly known as the Nusra Front, an al-Qaeda affiliate. 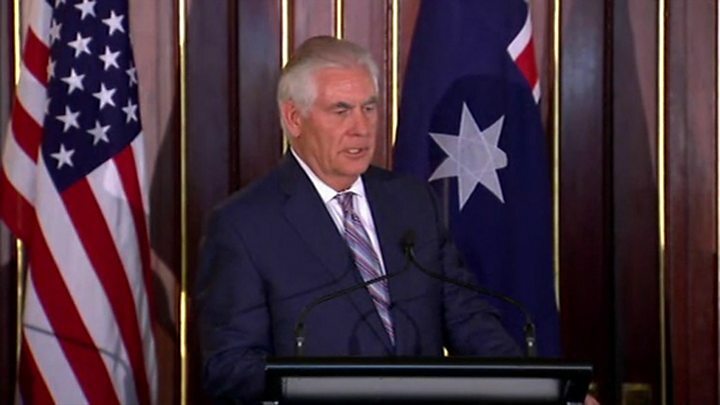 The SPA statement accused Qatar of backing these groups, as well as the Islamist Muslim Brotherhood - banned in Gulf countries as a terrorist organisation - and that it "promotes the message and schemes of these groups through their media constantly". Saudi Arabia itself is a key backer of Islamist rebels, including hardline jihadist groups, in Syria. Qatar, which is due to host the football World Cup in 2022, was critical of the decision. The foreign ministry said the decisions would "not affect the normal lives of citizens and residents". Iranian foreign ministry spokesman Bahram Qasemi said there was a need for "transparent dialogue and diplomacy", adding: "No country in the region will benefit from the heightened tension." Qatar's stock market closed down 7.27%. Nearly 90% of Qatar's population are migrant workers, many of whom are working on the construction boom fuelled by the successful World Cup bid. Emboldened by President Trump's trip two weeks ago, the Saudis and the Emiratis believe that this is the moment to make clear to Qatar that its divergent views will no longer be tolerated.